The wonderful new cook book My Daddy Cooks has just been released perfectly in time for Fathers Day. It is already a huge success in the top 200 on Amazon in it’s first 2 weeks, with 40 five star ratings…wow! I think books are the best gift idea becuse they give hours of pleasure and can be passed around too. Let me tell you about this one. Nick Coffer the author first came to my attention as a video blogger . In 2009 with his businness struggling in the recession, Nick decided to become a stay at home dad to his son Archie. He has never looked back and clearly adored this time with his son. A life long foodie it was importnat to Nick to encourage his toddler to love and appraciate and be involved with food. So they started to cook in Nick’s tiny kitchen together . 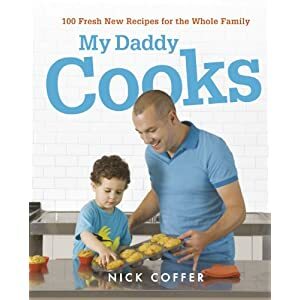 Soon they stated a video blog about their adventures at MY DADDY COOKS The blog was immediately a huge success (not just because oif the food also because Archie is just so darn so cute) and Nick began to create his own recipes. These have been extremely well received from the start. Soon Nick had a regular radio show on three counties radio and now his book has been released showcasing 100 fresh new recipes for the whole family. What started out as a hobby, something fun to do with his son, has become so much more. What a great thing to share. and that’s why his recipes are simple, straightforward, economical and speedy. Becuse Nick has lived home cooking with a little one he gets it right and this makes us all feel we can achieve it too. I’m not an enthusiastic cook but when I read no bake, 6 ingredients and 10 minutes prep even I feel encouraged. me and the kids made no bake choclate tiffin cake. It was LUSH! and I would happily give this as a gift when visiting friends. The kids had fun making it too. Next we are going to attempt The Easisest Mini Fudges (just 4 ingreds and 10 mins prep) can you see a pattern to my interst in cooking? Just think if I bought this as a Fathers Day gift it may be enough to give me a big break whilst the kids cook with daddy and I’d get lots of yummy sweet treats too! A cunning plan indeed. Like Nick says himself his recipes have been road tested in the roughest of environments (think kids underfot, a tiny kitchen…)and they still result in good, fresh, home cooked food thats really tasty. Definitely inspiring. There is a whole range of soups, sauces, puddings, one pots, pastas and salads in this book. I think you will just love it and aI anticipate it will becoame a firm family favourite.Buy one for Fathers Day and you may just get a little feet up time too! With a husband who is completely into cooking I am going to buy this for him. It sounds like a fab book.